When one of my child's birthdays sneaks up on me, I am almost certain that my heart is bursting with as much happiness as their's are. I am also equally certain that I am the only person in this family who's heart swings, like a pendulum, back and forth between that place of pure joy and a sensitive place of maternal sadness . And, maybe sad isn't an accurate description of my feelings. Whatever word would best summarize the heart of a mother who is completely in love with the birthday child, yet longing for time to slow it's course and hoping with real intensity to never, ever forgets a single memory, big or small that she has made throughout their life together. George's famous curls. A clear indicator of his ornery personality! I remember with great clarity everything surrounding George's birth. He was born the day after the Election of our 43rd president, George Bush. I laid on the couch all night while the house slumbered peacefully in the cool autumn silence. I was thankful to labor at home as long as possible, each contraction waking me up just enough to read the voting results through blurry eyes on the muted television screen. Very early the next morning, we were off to the hospital, and on that day, the 3rd of November, 2004 our beautiful son, George, was born. You can only imagine how every single person asked us if we named him after George Bush. People, please! Republicans we may be, but there's a list a mile long of saints and heros that our children will share the name of long before any politician. Sorry, George Bush did not make the cut. Our George was lovingly given the name of his Great Grandpa George (my father's father). Each of our children have three names. George's middle names, Patrick (after St. Patrick) and Thomas (after St. Thomas Moore) were deeply pondered and affectionately given to him with pride and joy. This year, George had no idea what to ask for for his birthday. So, he agreed to let Steve and I surprise him. 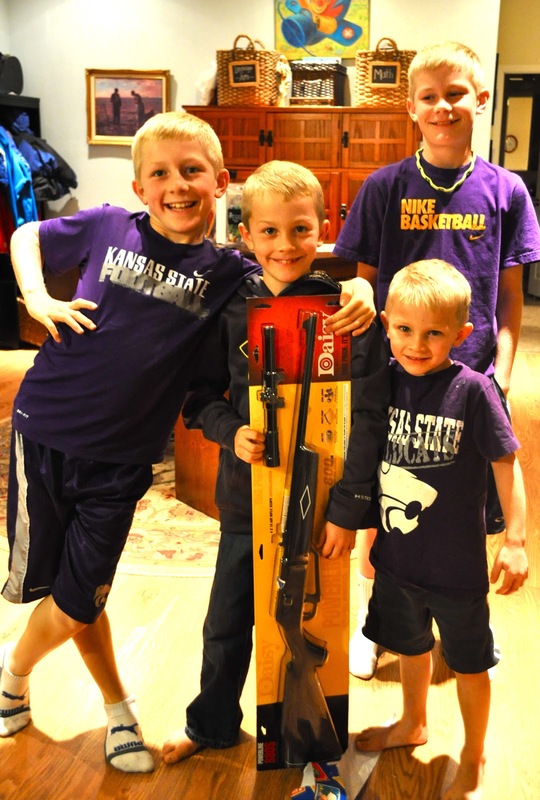 His brothers each bought him a small gift, and Steve and I thought he would really love to have a new sweatshirt to wear to wrestling practice and also his very own bb gun. We had no idea what a huge hit the gun would be! The image of his wide grin and cheerful expressions of thanks will forever be imprinted on my heart. George's only disappointment on his birthday was that I didn't make his cake. 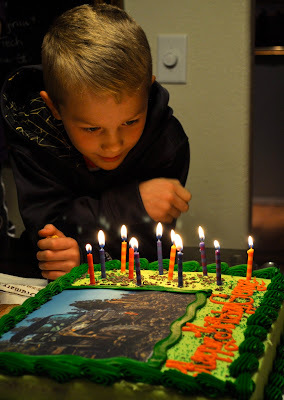 (Designing your birthday cake is a BIG deal around here, but unfortunately, Mommy's cake factory was closed due to a temporary case of crazyexhaustionitis.) Thankfully Sam's came to my rescue and the ATV/hunting/camo/lot's of green and brown and orange frosting cake suited him just fine. Every candle extinguished in just one breath1 He did it! My little asthmatic heart murmur trooper did it! I wish I could share with you through words complete, words that would fulfill my expectations, just how much I love you. But, any attempt I know will fail. Whenever I tell people that I have 5 boys they always ask me, "How do you do it?" My most honest reply is, "Well, the truth is, I GET to do it." I get to be your mommy, George. For some reason, God chose me to be your mommy, and I mean it when I say that each and every day, I am acutely aware of what a grand blessing this is. I know that I don't always show it, that my heart is concealed in the shadows of schedules and chores and responsibilities that make little or no sense to you at all at the blooming age of 8. But, you must know that I do see and relish the beautiful soul that you are. You are sensitive, adventurous, generous, creative, passionate and ornery. You live your life as a brother to your siblings in a loyal and deeply loving way, and I am proud of you for this. I have no doubt that our Lord has chosen you for me and me for you, and that the world is and our home is a brighter, happier, more hopeful place because you are in it! I will love you forever, and treasure every moment that I have with you! So sweet Susan. I bet there is never a dull moment around there with a houseful of boys! :) You have a beautiful family! He is such a handsome kid (all of your boys are!) and I love seeing such pure delight from kid's on their birthdays. good job on the presents!! George, you are indeed a beautiful young boy. Your Granny and Grandpa love every moment we share in your life. We have had countless coversations with you that simply left us either pondering your wisdom for your age or clinging to our sides with laughter. Many hugs, George! Such a good looking boy. Our third child has the middle name of George, also after a great-grandparent. When we agreed on the name, I was worried that it wasn't the name for a baby. Once his personality came through, the name fit perfectly. 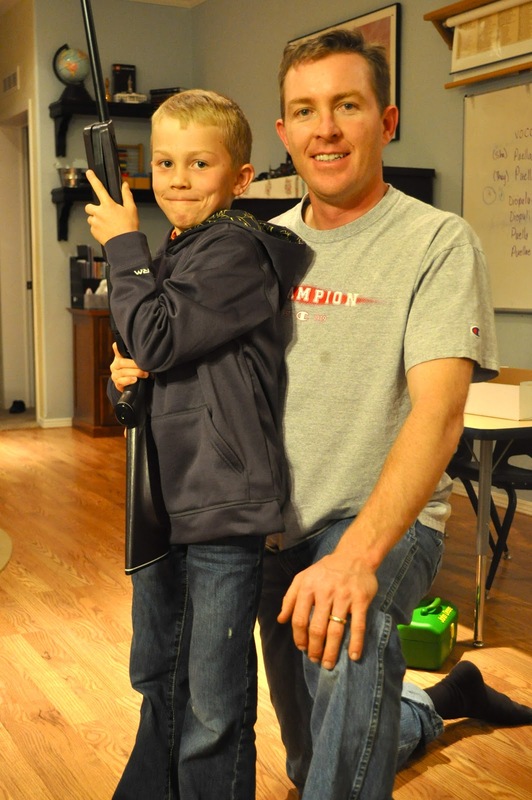 Your George's grin holding his bb gun looks very similar to my George's grin when he recieved his gun. That is the face of a seriously happy boy. Happy birthday, George! I didn't realize how much George looks like his mama. Very handsome boy. I can't believe how big he looks!! Seems like just the other day I was over at the house watching the boys and George was so 'little'...but here he is- all grown up!! What a handsome sweet boy he is becoming! Happy Birthday buddy!! I love love love your blog!!! So glad I found you! Oh God bless his little soul! 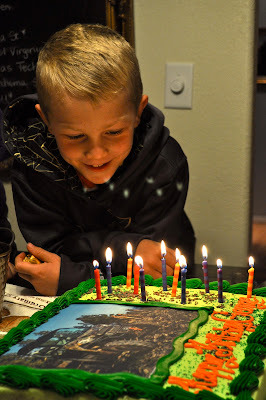 Happy 8th Birthday, George! What a beautiful letter. Oh, and those curls! Be still my heart. My youngest has a gorgeous head of curls that I am not ready to part with just yet. I fear cutting them will ruin his super powers. 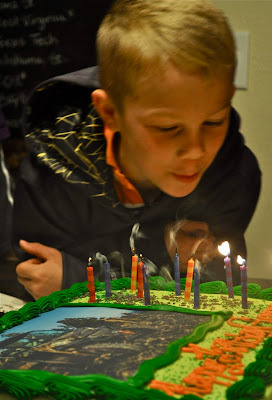 ;) And all of my boys would have LOVED that cake! The letter seems interesting to read. I would like to wish George for his 8th birthday and he's looking so sweet with the gun.